Swastikas spray painted in park, on school in Dartmouth, N.S. Residents of Dartmouth, N.S., woke up Sunday to swastikas and hateful messages spray painted in a city park, on a Catholic church and at a private school. The hate symbols associated with anti-Semitism were used to deface a band shell near Sullivan’s Pond. Benches in the park that were sponsored in memory of deceased loved ones were also vandalized. Resident Vanessa Lent said she was disturbed by what she saw. “It’s one thing if it’s kids and they’re painting lewd things or like a word or whatever, but a hate symbol is different." St. Peter’s Church and Prince Andrew High School were also struck by graffiti. Father Jim Richards said he knew something was wrong when he showed up to prepare for Sunday service and saw police. “Our church buildings among other buildings around here like the school here are places to help build up people's lives,” he added. Police are investigating and city workers were busy covering up the damage Sunday morning. The incident is only the latest case of spray painted vandalism in Nova Scotia. 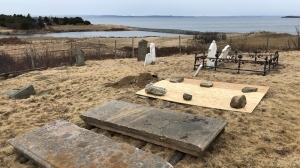 In June, churches, cemeteries and a golf course were damaged in Halifax, Bedford and Lower Sackville. Statistics Canada reports that criminal incidents motivated by hate rose three per cent in 2016 compared to 2015. Incidents targeting Jews rose 24 per cent that year from 178 incidents to 221. Meanwhile, crimes targeting Catholics fell 51 per cent from 55 to 27 incidents, and crimes targeting Muslims decreased 13 per cent from 159 incidents to 139 incidents. A man covers up graffiti in Dartmouth, N.S., on Sunday, Sept. 9, 2018. 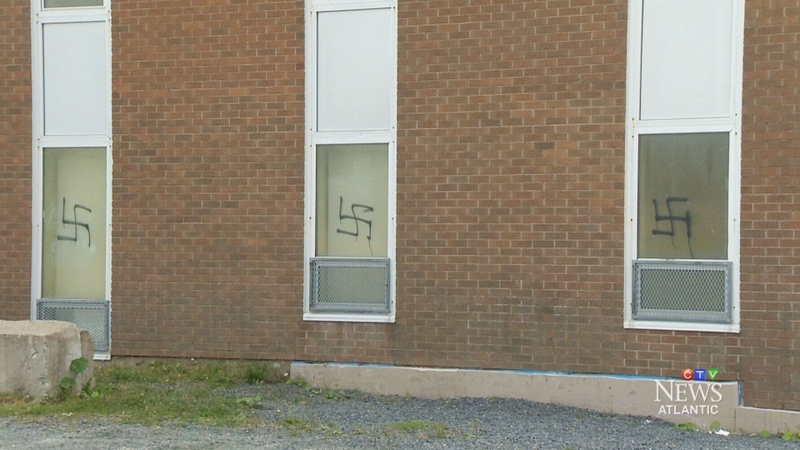 Swastikas sprayed on Prince Andrew High School in Dartmouth, N.S.